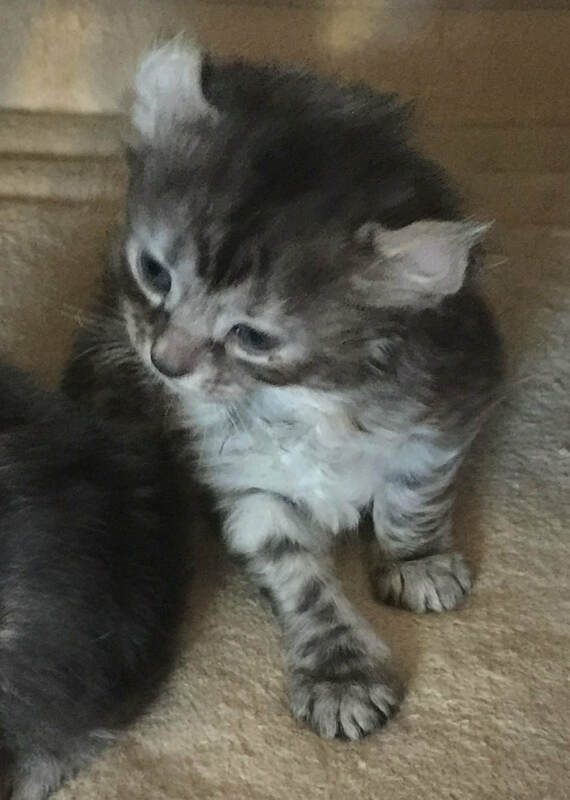 Curl Essence Silver Chalice ("Chalice") has 3 little girls born on 3/5, They are (1) Ashley, a black silver girl, (2) Gypsy, a silver girl, and (3) Monique, a silver patched girl. Chalice is a silver patched. 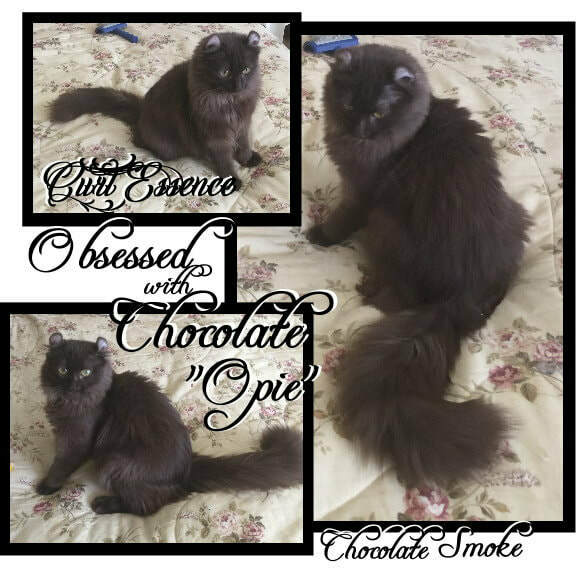 Opie is our chocolate smoke boy. Both are smaller cats. 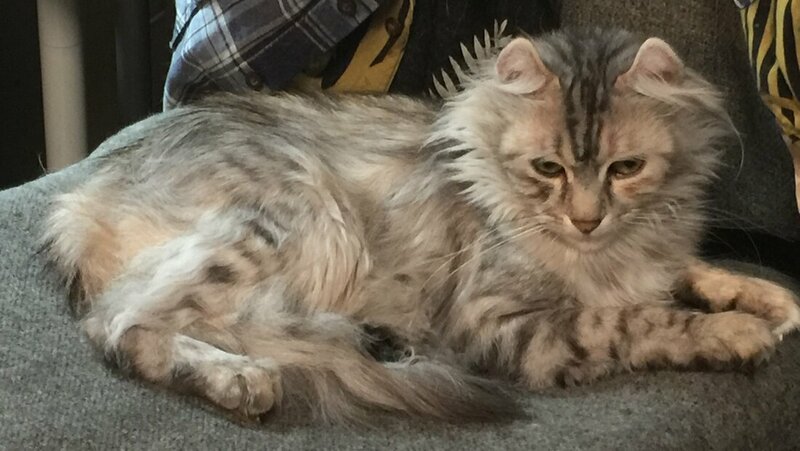 We never showed Chalice, but mainly just because we were showing other cats when she was a youngster and we just don't have the ability to show more than 2 cats at a time (sometimes 3, but absolutely no more). If you don't get your cat into the show halls when they are young, it gets really hard to show them. That's the main reason TICA lets us take a kitten into the show hall at 12 weeks. The kitten can't be entered into competition until its 16 weeks, but just that one first early experience with the sounds and smells helps to introduce the kitten to the show activity. Chalice is a beautiful girl and always has the prettiest babies. These babies are a little older than the previous photos and much (MUCH!) more active. We moved them into the 8ft kitten run so they can get more exercise and strengthen those little legs. I have a lot of really cute pictures. I may just include a bunch for you to look at. Here's a couple short little videos we took while we had them out. You can see Monique over on the far right being a little more cautious. This is Ashley on the far left. Ashley has a darker coat than the other 2. She is going to be a black silver. She will have a silver undercoat and you can already see the silver on her face and chest, but her back is black. Next to her in the middle is Gypsy. Gypsy is going to look more like mom. She has more of the silver already showing and starting to dominate her coat all over. Notice how mom looks mostly silver with shades of black... that's what Gypsy will look like. On the right is Monique. Monique is a silver patched. Her red splashes are already showing through her coat everywhere. Monique is the smallest of the 3. I woke these kids up for these photos. Then Gypsy, although I think she was more interested in seeing what her sister was up to. Monique was sound asleep. She barely budged when we I started taking these pictures. She finally perked up enough to show me her little face.